Most intrepid travelers would agree that experiencing a culture through its food may be the truest (and most alluring) gateway to its soul. “So what’s the food in Cuba really like?” —many wonder, often having heard a range of reviews from fellow travelers. If you think that no trip to Cuba would be complete without a proper dose of ropa vieja, picadillo, and flan, you’re absolutely right—but you’re in for a treat when you realize you’ve never heard of Buñuelos de Anís or Fricasé de Pollo and suddenly, the possibilities are endless! Cubans are known to do a lot with a little, and your palate will agree. Their innovative spirit shines through in the array of flavors you’ll find on your plate, rooted in simple but fresh ingredients. The Cuban people have reimagined their culture through food, as exemplified by the emerging and hip culinary scene in Havana. 1. La Guarida —The Enduring Classic— This gem makes it onto every list for good reason. 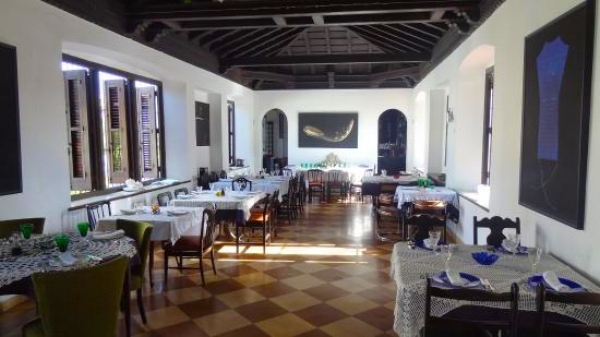 Its rustic feels and decaying colonial grandeur will take you back to the romance of 1920s Cuba. Take a slow stroll up its famous stairway, stopping for the inevitable photo opp, then take a seat on one of its multiple terraces overlooking the city and enjoy their international menu, where all cravings are sure to be satisfied. 2. Santy —The Hidden Gem— Behind an unmarked door, tucked away in a fishing village 20 minutes from the bustle of old city, Santy boasts the best tuna ceviche and grilled octopus in Havana. No need for a menu here, only the freshest catch of the day is served. It never disappoints. Don't be afraid to try the sushi! 3. El del Frente —The Urban Chic— this new restaurant is truly refreshing for the eyes and for the palate. The well-adorned interior complements impeccable design elements, with a beautiful rooftop providing the early evening Havana ambience we've long dreamed of. If you have a penchant for colorful cocktails and fresh-made tropical juices, the drink menu will dazzle you. The menu hosts a wide variety of classic Cuban and international dishes. Go for the grilled lobster. 4. Rio Mar —Best Unkept Secret— One of the first-movers in the Cuban culinary scene, Rio Mar is a secret-turned-sensation. Beautifully situated on the mouth of the Rio Almendares, it’s unbeatable sunset views and elegant contemporary décor set the mood for culinary indulgence. The menu is tried and true. You can't go wrong. 5. Atelier—The Best Food— Squeaking past Rio Mar to win best overall food quality, Atelier won't disappoint with its eclectic collection of art and old-age relics covering the walls of this restored Vedado mansion. Multiple dining levels and the antique wooden bar (complete with mixologist) complement the vibrant flavors masterfully created by their resident chefs. Start with the octopus salad, then move on to surf and turf! 6. Tierra —The VIP Tip— Located inside the VIP lounge at must-see nightlife hub Fabrica de Arte Cubano (FAC), Tierra is part of a trendy hub for in-the-know creatives and business owners. A reservation will grant you immediate access to the often-packed venue, sure to draw looks of envy from curious bystanders. After dinner, step right into nightlife and mingle with connected locals.